The project started in 1936, when the Rheinland (in Germany) was reoccupied and remilitarized. 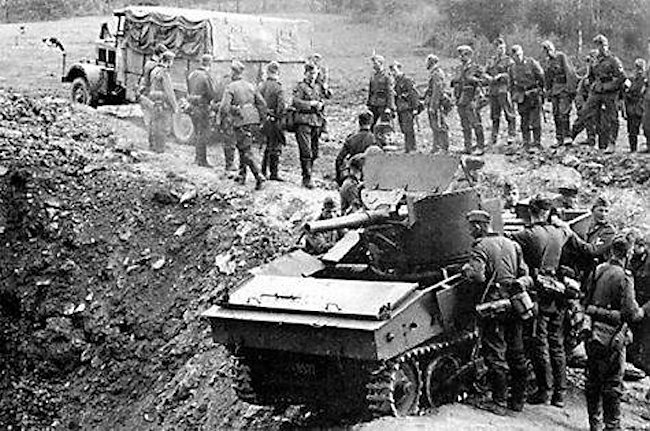 Along with a drastic plan of modernization and extension of the existing fortifications, lengthened military service and higher defense budget, the army had already requested a large plan of motorization, and later of modernization of its armored forces, which had already started in 1929. 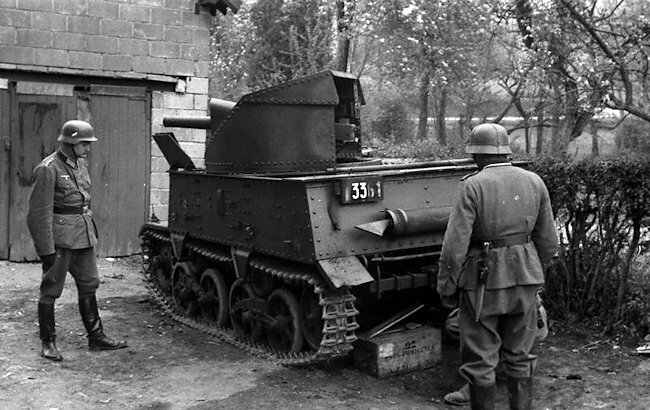 By then, the core of the Belgian armor was made of 75 obsolescent Renault FTs and two WWI Minerva armored cars. By 1929, British Carden Loyd experiments had drawn attention from all military commissions throughout Europe. 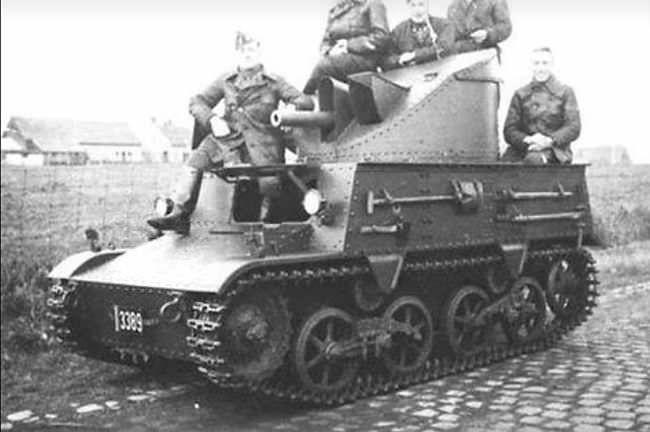 After seeing them in maneuvers, the Belgians chose to buy the already largely exported Mark VI for extensive tests, which were all passed near Brussels in 1931. At the same time, both the C47 FRC AT gun and the FRC 76 mm (2.99 in) AT gun were heavily tested, but it took way too long to unhook and prepare the gun for shooting when it was towed. 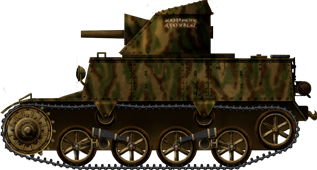 Six Carden-Loyd Mk.VI tankettes previously used for training were converted as improvised carriers, and largely tested, first with the 76 mm (3 in) gun. But the light chasis of these machines proved too weak to sustain the blast and recoil of the gun. They had a tendency to pitch violently and the rate of fire was slowed down for this reason. The FRC C47 gave better results, but the hull was still pitching too much to be quickly on line with the target, as required. For these reasons, and the fixed position of the gun, they proved of dubious utility in the heavily forested Ardennes area, and were passed in 1938 from the “Chasseurs Ardennais” to the “Cyclistes-Frontiere”. By 1934, the army has purchased 23(21?) Vickers-Carden-Loyd Artillery Tractors for the Chasseurs Ardennais, all towing Bofors 75 mm (2.95 in) M34 mountain guns. Despite being unarmed and unarmored, they were a stronger basis for experiments and, later on, 35 others were purchased from Vickers, to test the C47 mounted on a pivoting half turret, where the gun was protected by a partial shield. Because of the weight and compartmentation of the tractor, the gun had to be placed at the rear and pointing rearwards. 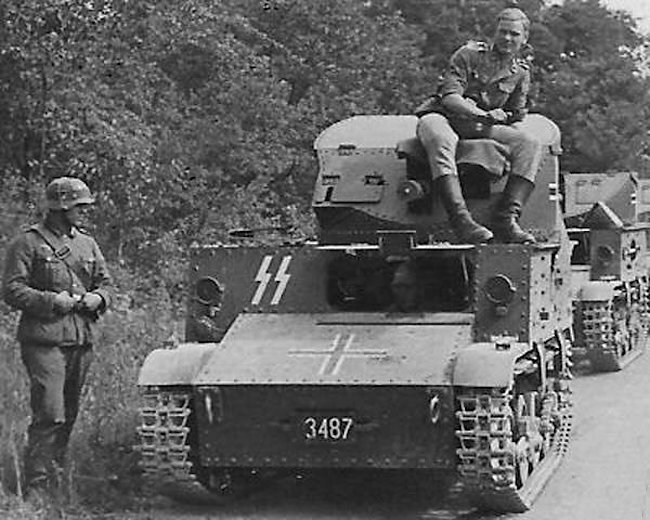 The only way to protect the driver and gun servants was a set of folding armored panels in an open-top configuration. The frontal panel had a vision slit on the left for the driver. As a consequence, the gun had a very limited traverse with full protection (120°), and, in order to be aimed in any direction, the three forward panels had to be folded down. This left the crew unprotected, but at least the gun servants still had the gun shield as partial cover. The gun was the 47 mm (1.45 in) FRC M32 AT, derived from the infantry model, and the turret was fitted on the right with an additional fixed machine-gun port, housing a F.N. model 30, a Belgian-built BAR automatic rifle. 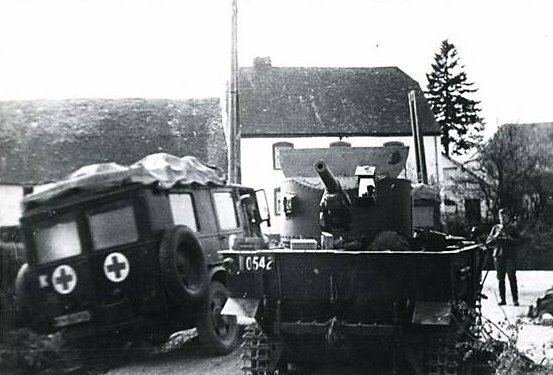 The T13 passed all tests successfully, and 32 units of this first variant, called B1, were produced by Miesse, a truck maker from Buysinghen, near Brussels. Armor was limited to 12 mm (0.47 in) on the main armored panels, hull sides and front, but the bottom, turret top and hull vertical surfaces were only 6 mm (0.24 in) strong. 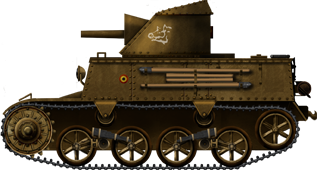 The B1 design was judged satisfactory enough to serve as a basis for the conversion of the remaining 23 gun tractors of the Chasseurs Ardennais. They were converted in 1936 on the same lines as the B1, with small differences of hull fittings, suspension and internal compartmentation. As such, these B1 and B2s formed the bulk of the motorized regiments of the Chasseurs Ardennais, generally placed in 6-strong mobile units. One B2 of the cyclist frontier of Limburg, (Maaseik group) is still preserved at the Brussels tank & army museum. However, the need for more motorized defense units and a more satisfactory design, as far as crew protection was concerned, led to a redesign of the type. 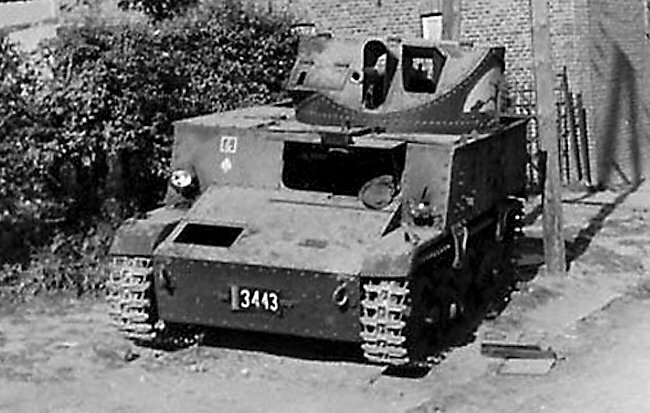 Belgium Army 1940 Carden Loyd T13 B3 Tank used the improved Vickers-Carden-Loyd Dragon Mk II B light tank chassis that could handle more weight. 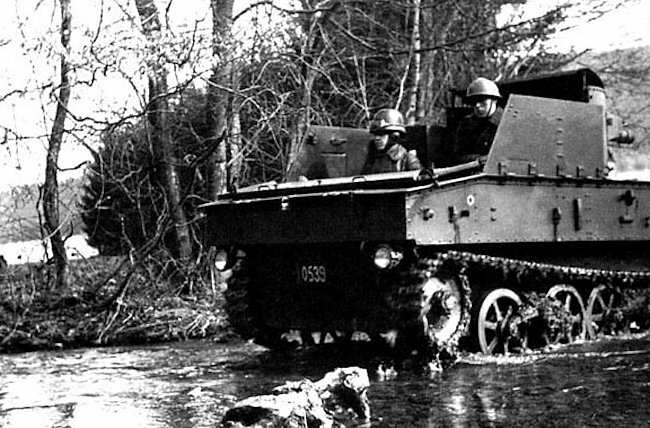 Searching for a better base to improve the tank-hunter design, a commission turned to the traditional supplier, Vickers, and purchased a single Vickers-Carden-Loyd Light Dragon Mk.II B (export version) for trials. This was found more stable, with better suspension, and sturdier than the original tractor, and led to a complete rebuild of the type, known as the B3. This was to be the most successful of all, built at “Atelier de construction de Familleureux”. The hull was higher, allowing the driver to be fully enclosed, as well as the gun feeder, although the turret, now with full 360° traverse, still had a partial shield, open at the rear. The suspension was sturdier, there were two return rollers, the tracks links were thicker and larger, and the engine was more powerful, but the armor was still light, with an average of only 13 mm (0.51 in) on the turret and hull bulkhead, protecting only from infantry fire. A first order of 194 units was placed in 1938, followed by a second one in September 1939, which were delivered until May 1940. Total production figures are not known precisely. The second order called for 158. This gives an estimation of 250-255 vehicles, but because of the lack of time for training and organization, many of the late production vehicles never reached operational level. 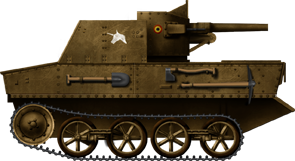 When war broke out in 1939, the T13 formed the bulk of the Belgian armored forces, with nearly 200 units. Symptomatic of its foreign policy, all were strictly intended for a defensive role, armed with the proven 47 mm (1.45 in) antitank gun. But the circumstances led them to be used as tanks, a task they were never designed for. The deficiencies in crew protection and gun traverse of the B1/B2 were partially compensated by the high muzzle velocity of the gun, which was described to have been capable of piercing through an armored half-track and then hitting the Panzer behind. 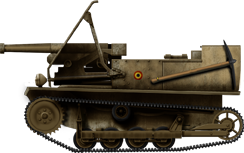 The larger Vickers tractors proved up to the task, and provisions were affected to the motorized border units, namely the Cyclist Frontiere regiments (generally equipped with 4 T13 B1/B2 each), and the elite Chasseurs Ardennais (6 T13 B3 for each unit). Others served as infantry support, in pairs or even as single units. In the harsh terrain of the Ardennes their tracks proved useful and they were small enough to be well camouflaged. But their main drawback was their weak armor. They had to shoot first in any case, and to break quickly before the reply, which would be fatal in any case. The 20 mm (0.79 in) autocannon of the Panzer II, as well as the 37 mm (1.46 in) gun of the Panzer III, not to speak of the 75 mm (2.95 in) of the Panzer IV, were all lethal, at any range, as well as all German AT guns, starting with the PaK 36. Ambushing and skirmishing tactics were preferred in the fierce delaying actions which took place at the frontiers on 10-11 May and went on until the 23rd, when the bulk of these motorized regiments had been almost annihilated, mostly because of the lack of air support, and lacking ammunition and fuel. But they had proven successful, with good crew training and well chosen and camouflaged positions. Another anecdote tells that a single T13 scored 5 Panzer kills, one after the other, before being spotted and silenced, during the border battles along the Meuse and the Ardennes. He was assigned to defend the fortified positions at Namur in the Belgium Ardennes when the Germans invaded 10th May 1940. He was in combat for 18 days. His company had orders to protect of the airfield in Evere and went to Woluwé St-Etienne. Later his mission was to protect the retreat of the Belgian Army. His tank was mentioned three times in the regimental ‘order of the day’. They were instructed to withdraw west to Flanders. Several times they came in contact with the enemy. 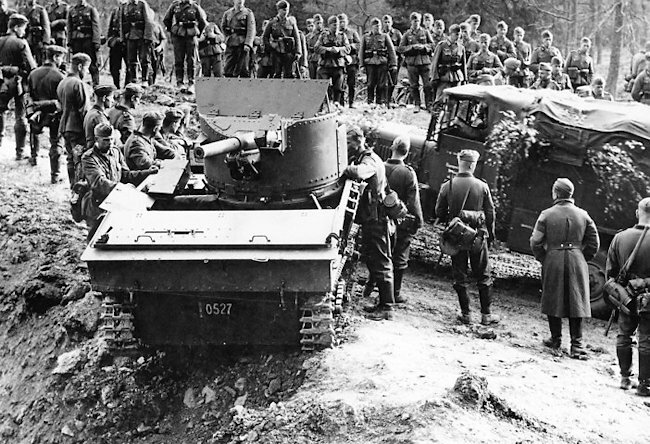 His company of T13 self-propelled guns destroyed German five tanks and enemy machine gun nests. Finally, in the vicinity of Roulers (Roeselare), they found themselves surrounded by the Germans. They then learnt over the radio, that at 6am 28th May 28 about 6 o’clock in the morning, the capitulation of the Belgian army. 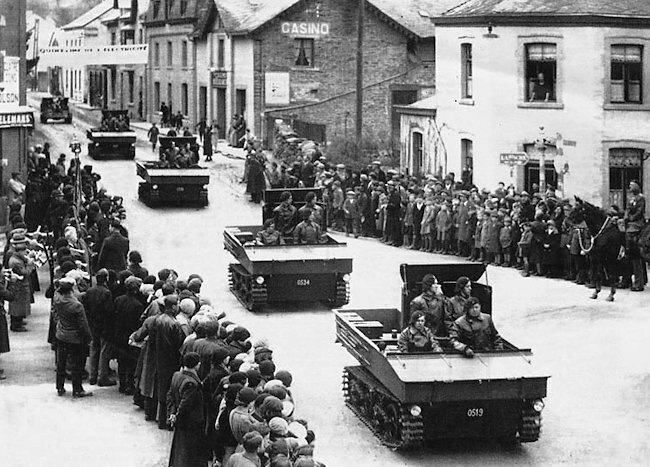 After the armistice was signed, the Germans took over large quantities of disabled, abandoned or half-sabotaged T13s, not counting those in depots or still under completion at the Familleheureux factory. 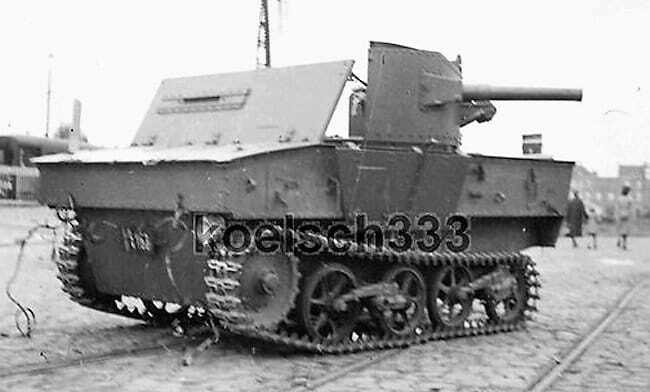 Those which were repaired and pressed to service were called Beutepanzer Vickers T13(b). Some photos show regular and SS units using some of them, as well as the Feldgendarmerie. 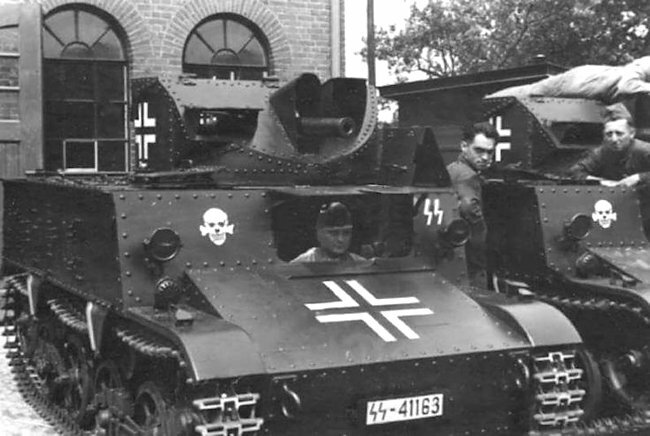 They were probably painted in dunkelgrau, showing large Balkan crosses over the turret, but some were also camouflaged. There are no records of any of them committed to external operations (outside Belgium), but many of these were still active by 1944, participating in the operations in this sector. Their main duty was probably to patrol and deal with Belgian resistance actions, local defense and crew training. None -outside the B2 at Brussels- seem to have survived to this day. 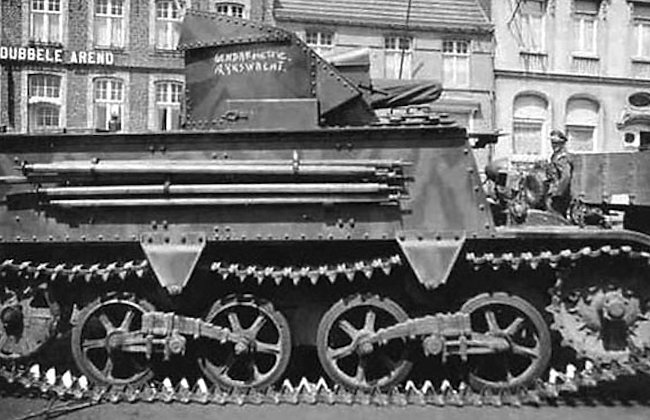 SA FRC 47 mm (1.45 in) mounted on a Carden-Loyd Mk.VI tankette. This early experiment was unsuccessful, as the hull was too light to cope with the muzzle blast and recoil of the gun. Only six were so converted. They were passed, in 1938, from the Chasseurs Ardennais to the Cycliste Frontiere regiment, and placed in fixed ambushing positions between Vivegnis and Lixhe (Meuse river western banks), firing some rounds on the Germans on 10-11 May 1940. 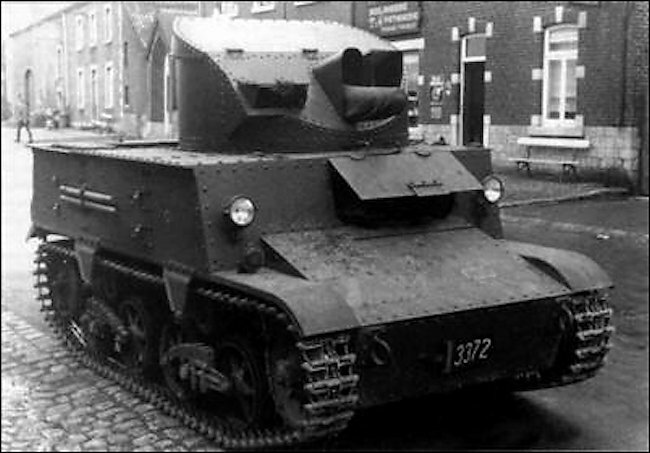 Vickers T13 B1, first version of this prolific tank-hunter (32 units delivered). The gun was partially protected, and could be fully traversed only when the driver compartment armored panels were folded. Unknown unit (unicorn), Cyclist Frontiere unit, central plains near Liege, May 1940. Vickers T13 B2, 3rd Lanciers (1DC), May 1940. The panels were folded, which left the crew unprotected, but the gun had full traverse. Only 21 B2s were produced (23 from other sources). T13 B3 of the elite Chasseurs Ardennais with the famous Ardennes wild boar insignia, Albert Canal, 10-12 May 1940. Over 255 units seem to have been delivered until May 1940, but far fewer were actually serviceable in time. 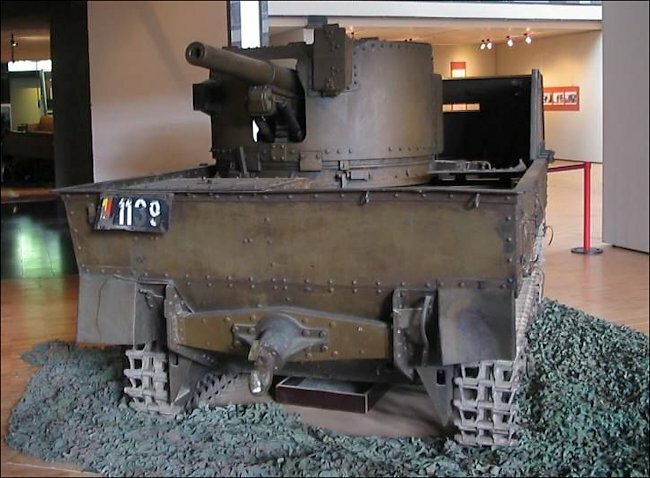 The front and side armour plates are hinged and can flap down on this Carden Loyd T13 B2 SPG at the Belgium Tank Museum in the Royal Army and Military History Museum, Jubelpark 3. Brussels. Drawing of T.13B2 is not correct. Different mudguards and towing hook than those of the B1. Did all the T13 variants have 360 degree traverse for the 47mm? Once the pannels were taken down, yes, pretty much.